The newest Schoen is finally here. 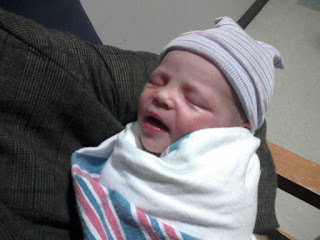 Baby girl arrived 11/11 at 11:56 PM weighing 8 lbs 2 ounces, 21 inches long with light blue eyes and black peach fuzz hair. Woo Hoo!!!! Michelle is doing well considering what she went through. We haven't seen our new little great niece yet, but Annie tells me she is beautiful (of course, look at her parents!) and the sweetest little girl ever. Jury is still out on her name; Charli is under consideration -- personally I love that name -- but we'll know soon enough. Going up to see her today and I can't wait! Welcome little one!!! Update 11/13/08: Here name is Charli! More pix here.